The bicycle is an efficient alternative to motorized vehicles all around the world, but in cities like Beijing where the air quality is beyond horrendous, biking can actually be hazardous to the health. Beijing-based artist Matt Hope came up with a creative way to ride his bike through the city without harming his lungs with the notoriously polluted air. 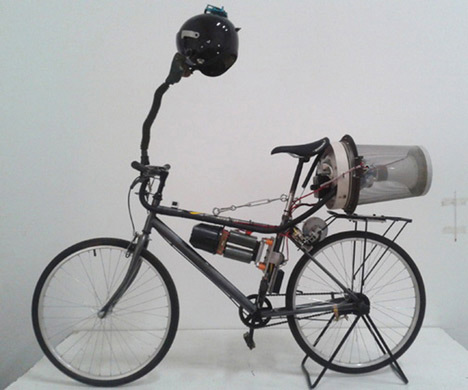 The Breathing Bike is a bicycle that features a 5,000V air filtration system. 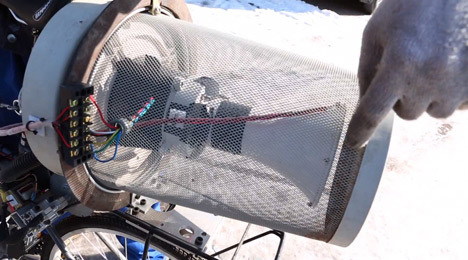 The filter is powered by the turning of the bike’s pedals, and air is pulled into a mesh trash can and through the filter. The clean, non-carcinogenic air is then moved through a hose that is attached to a fighter pilot mask on Matt’s face. The artist notes (somewhat jokingly) that riding the Breathing Bike in the rain would probably result in a quick death. But in all seriousness, riding a bike daily in a city with dangerously polluted air over the course of years is a very real health hazard. Maybe Matt’s bike looks a little silly, but personal air filters like this one might just become standard issue in future years in the worst polluted cities. See more in Bikes & Cycles or under Transportation. February, 2013.